Ginseng has a mystique of its own, its documented use in the Far East extending back to pre-history. 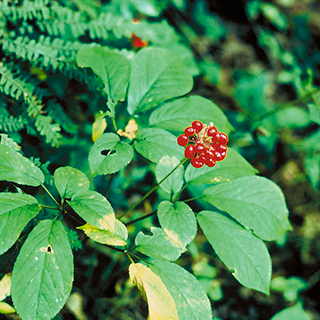 American ginseng (Panax quinquefolius) is for all practical purposes medicinally interchangeable. Ginseng is adaptogenic, assisting in adaptation to stress. The herb boosts energy, improves work performance, increases resistance to disease, tonifies nerves, improves sexual stamina and potency, has a normalising effect (reduces high blood sugar and cholesterol, increases low red blood count, raises low blood pressure, lowers high blood pressure), is a digestive tonic, protects from the deleterious effects of radiation therapy and chemotherapy, and promotes longevity. It has also been linked to weight loss benefits, with one study showing that ginseng extract consumption not only caused improvements in insulin sensitivity, but helped with the loss of a significant amount of weight after a few weeks. A decoction of 1/2 oz. (14 g) of the root, boiled in tea or soup and taken every morning. 1-2 ml a day or as instructed, standardized to 4% ginsenosides. Standardized to at least 4% ginsenosides, use as directed. Chew the fresh or dried root. The dosage is about 1g per day for the adaptogenic effects. Greater quantities will stimulate the central nervous system and often prove markedly aphrodisiac. Propagation by cuttings of the roots is the most successful method, the cuttings being placed in sand, under a handglass. Seeds, generally obtained from abroad, are sown in pots in the early spring and require gentle heat. When the plants are a few inches high, they must be transplanted into beds or sheltered borders. They require a good, warm soil, but much shade. To grow on a commercial basis is not considered feasible in this country. The root is harvested after seven years; the older the root, the better its strength and quality. The root should be collected only in the autumn, in which case it retains its plump and handsome appearance after drying.